First Appearance: Showcase #22 (Sep.-Oct. 1959): "SOS Green Lantern"
Action Comics (vol. 1) #488 (Oct. 1978): "A Close Shave for Air Wave!" Action Comics (vol. 1) #512 (Oct. 1980): "Sinister Spectacle of Sunspotter"
Aquaman Secret Files & Origins #1 (Dec. 1998): "Left for Dead"
The Brave and the Bold (vol. 1) #28 (Feb.-Mar. 1960): "Starro the Conqueror!" The Brave and the Bold (vol. 1) #29 (Apr.-May 1960): "Challenge of the Weapons Master"
The Brave and the Bold (vol. 1) #30 (June-July 1960): "The Case of the Stolen Super-Powers!" Catwoman (vol. 3) #77 (May 2008): "Waking Up On the Wrong Side of the Universe, Part Three"
Darkstars #11 (Aug. 1993): "Escalation of Hostilities"
DC Special Series #6 (1977): "Death Times Five"
DC/Marvel All Access #4 (Feb. 1997): "Savior"
Deathstroke, the Terminator #13 (Aug. 1992): "The Powers That Be"
Final Crisis #7 (Mar. 2009): "New Heaven, New Earth"
Green Lantern (vol. 2) #1 (July-Aug. 1960): "The Planet of Doomed Men"
Green Lantern (vol. 2) #1 (July-Aug. 1960): "Menace of the Giant Puppet!" 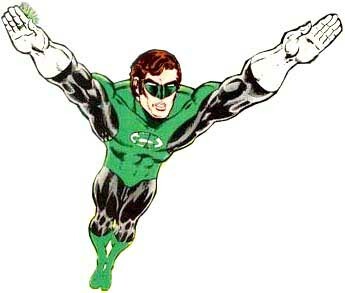 Green Lantern (vol. 2) #2 (Sep.-Oct. 1960): "The Secret of the Golden Thunderbolts!" Green Lantern (vol. 2) #2 (Sep.-Oct. 1960): "Riddle of the Frozen Ghost Town!" Green Lantern (vol. 2) #3 (Nov.-Dec. 1960): "The Amazing Theft of the Power Lamp!" 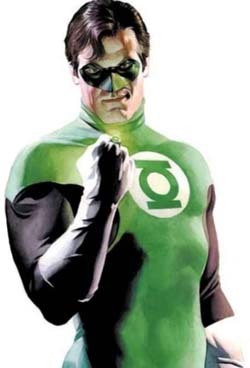 Green Lantern (vol. 2) #3 (Nov.-Dec. 1960): "The Leap Year Menace!" Green Lantern (vol. 2) #88 (Feb.-Mar. 1972): "Summons from Space!" Green Lantern (vol. 2) #130 (July 1980): "Sonar's Sonic-Atomic Attack"
Green Lantern (vol. 2) #192 (Sep. 1985): "First Star I See Tonight!" 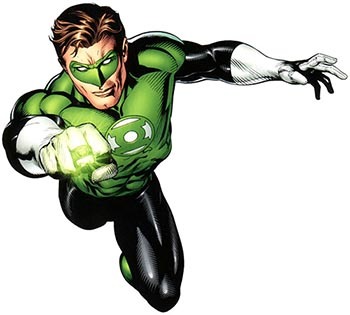 Green Lantern (vol. 3) #19 (Dec. 1991): "Lantern's Light"
The Green Lantern Corps (vol. 1) #203 (Aug. 1986): "The Diabolical Dr Ub'x!" Green Lantern Corps Quarterly #5 (Summer 1993): "Whatever Happened to Itty?" Green Lantern Corps Quarterly #8 (Spring 1994): "The Book of Endings!" Green Lantern Sinestro Corps Special #1 (Aug. 2007): "The Greatest Once, the Greatest Again"
Green Lantern: Ganthet's Tale (Mar. 1992): "Ganthet's Tale"
Hawkman (vol. 3) #2 (Oct. 1993): "Dead End"
Just Imagine Stan Lee With Chris Bachalo Creating Catwoman (July 2002): "On the Street"
Justice League America #92 (Sep. 1994): "The Program"
Justice League International (vol. 2) #53 (Aug. 1993): "Deadly Liaisons"
Justice League International (vol. 2) #59 (Dec. 1993): "Ordinary People"
Justice League International (vol. 2) #60 (Jan. 1994): "Out of the Future"
Justice League International (vol. 2) #61 (Feb. 1994): "Born of Man and Woman"
Justice League of America (vol. 1) #1 (Oct.-Nov. 1960): "The World of No Return!" Justice League of America (vol. 1) #2 (Dec. 1961 - Jan. 1962): "Secret of the Sinister Sorcerers!" Justice League of America (vol. 1) #3 (Feb.-Mar. 1961): "The Slave Ship of Space!" Justice League of America (vol. 1) #4 (Apr.-May 1961): "Doom of the Star Diamond"
Justice League of America (vol. 1) #5 (June-July 1961): "When Gravity Went Wild!" Justice League of America (vol. 1) #6 (Aug.-Sep. 1961): "The Wheel of Misfortune!" Justice League of America (vol. 1) #7 (Oct.-Nov. 1961): "The Cosmic Fun-House!" Justice League of America (vol. 1) #8 (Dec. 1961 - Jan. 1962): "For Sale--The Justice League!" Justice League of America (vol. 1) #9 (Feb. 1962): "The Origin of the Justice League!" Justice League of America (vol. 1) #10 (Mar. 1962): "The Fantastic Fingers of Felix Faust!" Justice League of America (vol. 1) #11 (May 1962): "One Hour to Doomsday!" Justice League of America (vol. 1) #12 (June 1962): "The Last Case of the Justice League!" Justice League of America (vol. 1) #13 (Aug. 1962): "The Riddle of the Robot Justice League!" Justice League of America (vol. 1) #14 (Sep. 1962): "The Menace of the "Atom" Bomb!" Justice League of America (vol. 1) #15 (Nov. 1962): "The Challenge of the Untouchable Aliens"
Justice League of America (vol. 1) #16 (Dec. 1962): "The Cavern of Deadly Spheres!" Justice League of America (vol. 1) #17 (Feb. 1963): "The Triumph of the Tornado Tyrant"
Justice League of America (vol. 1) #18 (Mar. 1963): "Journey into the Micro-World!" Justice League of America (vol. 1) #19 (May 1963): "The Super-Exiles of Earth!" Justice League of America (vol. 1) #20 (June 1963): "The Mystery of Spaceman X!" Justice League of America (vol. 1) #21 (Aug. 1963): "Crisis on Earth-One!" Justice League of America (vol. 1) #22 (Sep. 1963): "Crisis on Earth-Two!" Justice League of America (vol. 1) #23 (Nov. 1963): "Drones of the Queen Bee!" Justice League of America (vol. 1) #24 (Dec. 1963): "Decoy Missions of the Justice League"
Justice League of America (vol. 1) #25 (Feb. 1964): "Outcasts of Infinity!" Justice League of America (vol. 1) #26 (Feb. 1964): "Four Worlds to Conquer!" Justice League of America (vol. 1) #27 (May 1964): "The "I" Who Defeated the Justice League!" Justice League of America (vol. 1) #28 (June 1964): "The Case of the Forbidden Super-Powers!" Justice League of America (vol. 1) #35 (May 1965): "Battle Against the Bodiless Uniforms"
Justice League of America (vol. 1) #39 (Nov. 1965): "Starro the Conqueror!" Justice League of America (vol. 1) #48 (Nov.-Dec. 1966): "Challenge of the Weapons Master"
Justice League of America (vol. 1) #48 (Nov.-Dec. 1966): "Secret of the Sinister Sorcerers!" Justice League of America (vol. 1) #48 (Nov.-Dec. 1966): "The Slave Ship of Space!" Justice League of America (vol. 1) #58 (Nov.-Dec. 1967): "The World of No Return!" Justice League of America (vol. 1) #58 (Nov.-Dec. 1967): "The Wheel of Misfortune!" Justice League of America (vol. 1) #58 (Nov.-Dec. 1967): "For Sale--The Justice League!" Justice League of America (vol. 1) #67 (Nov.-Dec. 1968): "Doom of the Star Diamond"
Justice League of America (vol. 1) #67 (Nov.-Dec. 1968): "The Menace of the "Atom" Bomb!" Justice League of America (vol. 1) #75 (Nov. 1969): "In Each Man There Is a Demon"
Justice League of America (vol. 1) #76 (Nov.-Dec. 1969): "The Cosmic Fun-House!" Justice League of America (vol. 1) #76 (Nov.-Dec. 1969): "The Last Case of the Justice League!" Justice League of America (vol. 1) #85 (Nov.-Dec. 1970): "The Fantastic Fingers of Felix Faust!" Justice League of America (vol. 1) #85 (Nov.-Dec. 1970): "One Hour to Doomsday!" Justice League of America (vol. 1) #93 (Oct.-Nov. 1971): "The Riddle of the Robot Justice League!" Justice League of America (vol. 1) #93 (Oct.-Nov. 1971): "Journey into the Micro-World!" Justice League of America (vol. 1) #153 (Apr. 1978): "Earth's First and Last Super-Hero!" Justice League of America (vol. 2) #0 (Sep. 2006): "Yesterday, Today, Tomorrow"
Justice League of America (vol. 2) #1 (Oct. 2006): "The Tornado's Path, Chapter One: Life"
Justice League of America (vol. 2) #2 (Nov. 2006): "The Tornado's Path, Chapter Two: Tornado Red / Tornado Blue"
Justice League of America (vol. 2) #3 (Dec. 2006): "The Tornado's Path, Chapter Three: The Brave & the Bold"
Justice League of America (vol. 2) #4 (Jan. 2007): "The Tornado's Path, Chapter Four: Being Human"
Justice League of America (vol. 2) #9 (July 2007): "The Lightning Saga, Chapter Three: Suicide"
Justice League of America (vol. 2) #10 (Aug. 2007): "The Lightning Saga, Final Chapter: The Villain Is the Hero in His Own Story"
Justice League of America (vol. 2) #22 (Aug. 2008): "The Second Coming, Chapter One: The Widening Gyre"
Justice League of America (vol. 2) #23 (Sep. 2008): "The Second Coming, Chapter Two: Things Fall Apart"
Justice League of America (vol. 2) #24 (Oct. 2008): "The Second Coming, Chapter Three: The Blood-Dimmed Tide"
Justice League of America (vol. 2) #25 (Nov. 2008): "The Second Coming, Chapter Four: The Best Lack All Conviction"
Justice League of America (vol. 2) #29 (Mar. 2009): "Star Struck!" Justice League of America (vol. 2) #31 (May 2009): "Welcome to Sundown Town: Interlude: Crisis of Confidence"
Justice League Quarterly #15 (June 1994): "A Hole in the World"
Justice League: Cry for Justice #1 (Sep. 2009): "The Beginning"
Justice League: Cry for Justice #2 (Oct. 2009): "The Gathering"
Justice League: Cry for Justice #3 (Nov. 2009): "The Villain"
Justice League: Cry for Justice #4 (Dec. 2009): "The Fix"
Justice Society of America (vol. 3) #8 (Oct. 2007): "Belles & Whistles"
Outsiders: Five of a Kind - Wonder Woman/Grace #1 (Oct. 2007): "Five of a Kind, Part 5: Member of the Tribe"
Secret Society of Super-Villains #2 (July-Aug. 1976): "No Man Shall I Call Master!" Secret Society of Super-Villains #3 (Sep.-Oct. 1976): "War for Earthdeath!" Secret Society of Super-Villains #4 (Nov.-Dec. 1976): "When Thieves Fall Out..."
Secret Society of Super-Villains #5 (Jan.-Feb. 1977): "Endgame!" Showcase #22 (Sep.-Oct. 1959): "SOS Green Lantern"
Showcase #22 (Sep.-Oct. 1959): "Secret of the Flaming Spear!" Showcase #22 (Sep.-Oct. 1959): "Menace of the Runaway Missile!" Showcase #23 (Nov.-Dec. 1959): "Summons from Space!" Showcase #23 (Nov.-Dec. 1959): "The Invisible Destroyer!" Showcase #24 (Jan.-Feb. 1960): "The Secret of the Black Museum!" Showcase #24 (Jan.-Feb. 1960): "The Creature That Couldn't Die!" Teen Titans (vol. 1) #25 (Jan.-Feb. 1970): "The Titans Kill a Saint?"